When Dell recently announced a low-priced chromebook -- based on Google's Chrome OS -- it became the last major Windows PC maker to embrace the cloudbook phenomenon. Like the stubborn CIO that resisted the cloud computing trend but eventually faced up to the market reality, Dell has finally accepted what others knew to be true -- the glory days of the high-priced PC era are over. Worldwide personal computer (PC) shipments are expected to fall by -10.1 percent by the end of 2013, slightly below the previous projection of -9.7 percent. That's, by far, the most severe yearly market contraction on record, according to the latest market study by International Data Corporation (IDC). Interest in PCs has remained limited, leading to little indication of positive growth beyond replacement of existing systems. Total shipments are expected to decline by an additional -3.8 percent in 2014 before turning slightly positive in the longer term. At these rates, total PC shipments will remain just above 300 million during the forecast period -- barely ahead of 2008 volumes. Even in emerging markets -- once seen as a primary growth engine of the PC market -- shipments are projected to decline in 2014 and later recover by only a few percent. 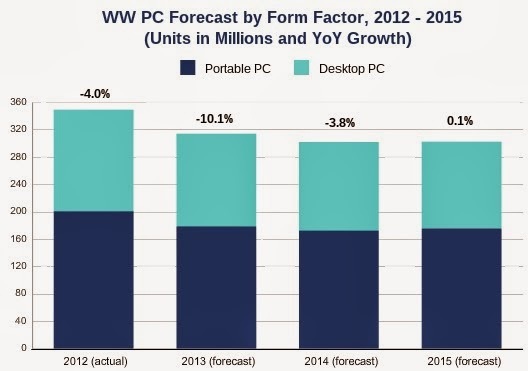 The commercial PC market is faring somewhat better than the consumer PC market in 2013 with shipments declining by -5 percent year over year compared to nearly -15 percent for consumer. The relative stability is due to a mix of more stable PC investment planning, a smaller impact from tablets, and to replacements of Windows XP systems before the end of support planned for 2014. However, the long-term outlook for the two markets is not significantly different, with a small decline projected for both consumer and commercial segments in 2014 with near flat growth in the longer term. "Perhaps the chief concern for future PC demand is a lack of reasons to replace an older system," said Jay Chou, senior research analyst at IDC. While IDC research finds that the PC still remains the primary computing device – for example, PCs are used more hours per day than tablets or phones – PC usage is nonetheless declining each year as more devices become available. And despite industry efforts, PC usage has not moved significantly beyond consumption and productivity tasks to differentiate PCs from other devices. As a result, PC lifespans continue to increase, thereby limiting market growth. Microsoft, and its key channel partners, may find some relief in a very competitive world marketplace. The Windows-based tablet market is expected to grow to 39.3 million units by 2017 -- from less than 7.5 million in 2013 and less than 1 million in 2011. However, relative to a PC market size of roughly 300 million units, these Windows tablets would add just a couple of percentage points a year. 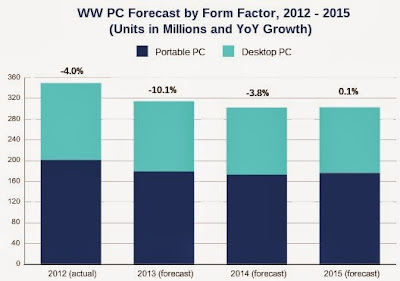 Even so, these new Windows devices are projected to account for 10 percent of a combined PC and Tablet market by 2016 – making them an important potential upside growth opportunity for the struggling traditional Wintel PC ecosystem.